Hello, I suppose we should introduce ourselves, we’re Bertha’s Pizza, Graham, Kate & Meg, do say hi if you see us about. I guess you’re wondering what’s happening to this beautiful building - we’re proud to say it’s becoming our home. Our journey started 6 years ago with a backyard oven named Bertha and a dream to make world class pizza. 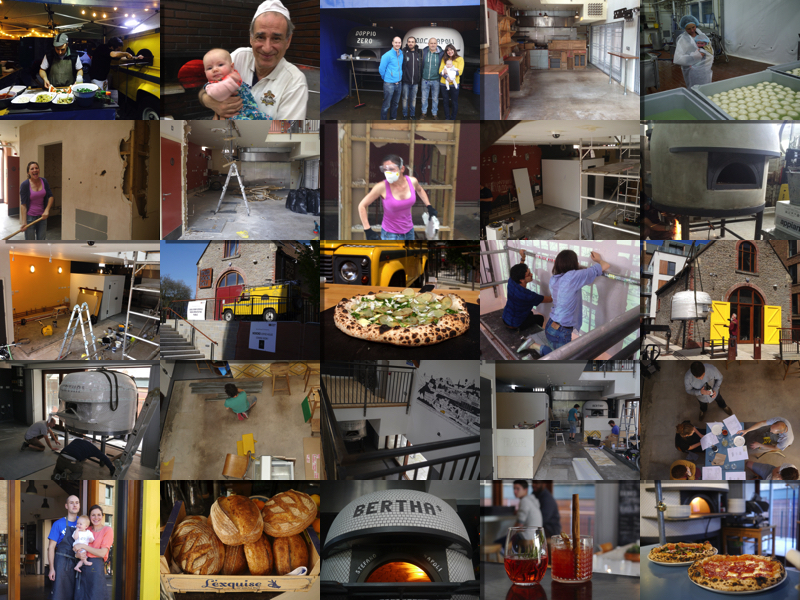 As a hobby became an obsession, and we spent our holidays working in some of the world’s best pizzerias, mobile Bertha was born and for the past few years we’ve been touring far and wide. If you’ve seen a bright yellow Land Rover with an oven shoehorned in the back that’d have been us. We made the final of the BBC Food & Farming Awards in our first year of trading and The Sunday Times has just listed us as one of the top 25 pizzerias in the UK, all very flattering for a modest mobile setup. The accolades are nice but our real goal is to create a friendly, owner-run, neighbourhood restaurant serving simple, affordable food which brings a smile to your face. We’ve commissioned 3 tonnes of mosaicked, hand built Neapolitan oven, the third iteration of Bertha and the beating heart of our restaurant. 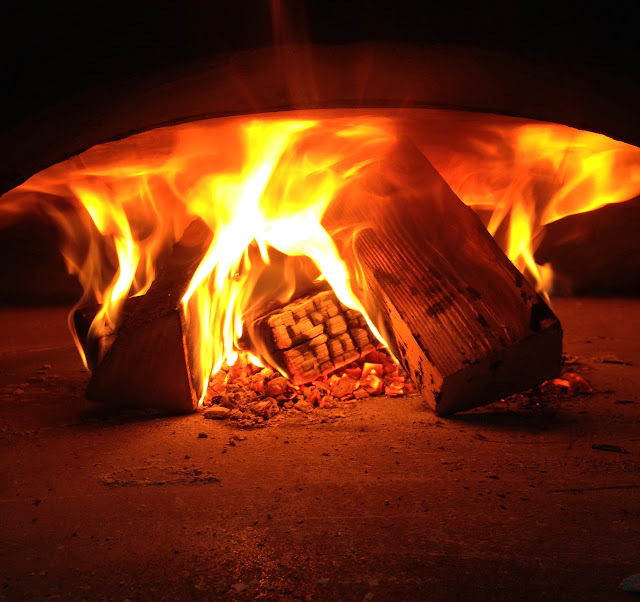 She’ll run at over 500C cooking pizzas in 60 seconds, the searing heat creating loft and flecks of char on our characteristic long ferment sourdough base. We will continue to team up with the best producers, the more local and sustainable the better. 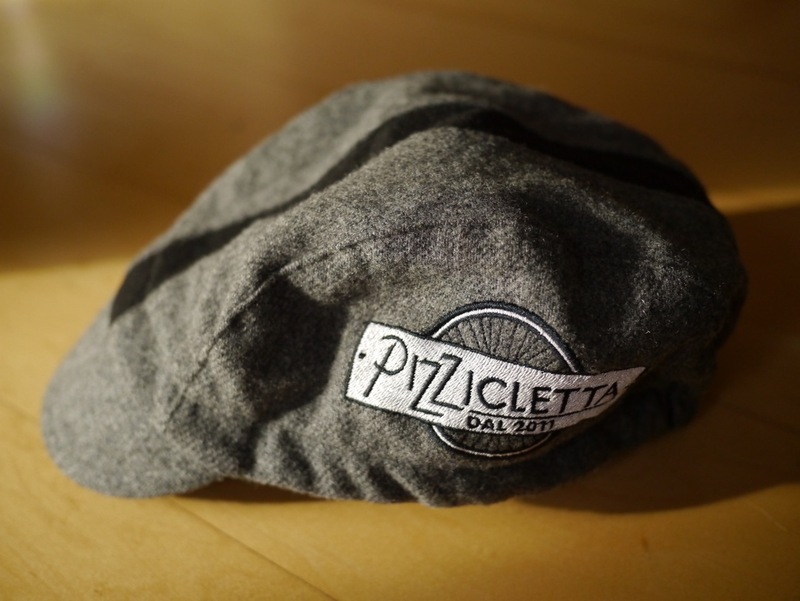 We’re not doing this for fashion, trends, or even to sell more pizza. We’re doing it because we care and because we want to see those we partner with flourish too. Our menu will remain concise, focussed on doing one thing well - pizza. But within the remit of dough and fermentation don’t be surprised if you see fresh bread for sale and our own house made mozzarella, charcuterie and ferments featuring in our toppings. The aim’s to open in August with a week’s soft launch prior for those who’ve helped us get this far; if you’d like to be part of this, to join the family and provide feedback to shape your neighbourhood pizzeria then drop us an email on the address below. We’ve written about our past before, in fact it’s on the front page of our website - we were looking for a change of direction, a route out of London, a vocation not a chore. We sat there sharing the food we’d cooked with friends and the answer stared back at us - pizza. I’ve followed the time honoured career path from engineering to finance to artisan sourdough pizza, which isn’t quite as daft as it sounds as a love of food and sharing it with others was the one constant throughout. People are often shocked by the transition from banker to baker but for World Escape Day we wanted to list the top 3 skills we’d learned in one life and applied in another. Network - a networking event was my idea of hell, but change the subject matter and it’s more like catching up with friends. I look forward to meeting with new suppliers and those with a passion for the best produce, sustainability and provenance. The connections you make in your new chosen field are invaluable, embrace every opportunity to expand your network. You’ve picked this new area, I promise it’ll be far less painful chatting to others about it. Work ethic - by most people’s standards I used to work long hours, I’ve never been work shy. Nothing quite prepares you though for the slog of starting your own business. I envy those who leave the office and don’t spare it another thought until they arrive the next day. I’ve barely switched off since we started - I need to get better at this - but it only shows how much we care. I think it was the Innocent book which referred to ‘The Eastenders Test’. If you get home from a 10-hour day and you still have the drive to spend another 5 hours working on your project (rather than simply watching Eastenders) then you’ve got what it takes to put in the long, hard hours to turn your idea into a reality. I hate Eastenders but we did 6 months of this before selling our first pizza. Play to your strengths - For engineering and finance you need to be numerate but it’s been more handy than we’d expected for our fledgling business. Models to predict when the dough would be ready, ramp geometry to get the oven level, restaurant projections, it all helps to know your way around a spreadsheet. You’ll have a string to your bow which can be applied to your escape. That's Harris above. I'm sat in a Shoreditch coffee shop writing this newsletter, a flat white sipping cliché. The caffeine’s required though, there’s a lot to catch up on. Our last newsletter came out just after we’d returned from our US pizza road trip. Time dilates in wedding and festival land, the long evenings, cheery customers and late night drives home blurring into one another. Flicking back through the calendar we’ve been busy. Did we even mention we were finalists in the BBC Food and Farming Awards? We made the last three in the street food category, which with less than a year’s trading under our belt was more than we could ever ask for. We got to meet some amazing people, Giorgio Locatelli had a play on the oven and has even taught me the ‘poor pizzaiolo hands’. I struggle to describe the DO Lectures, an ‘ideas festival’ comes up short. It’s the moments around the campfire, the chat with the speaker you admire on a crazed early morning run / swim, which make it special. But special it is and we were lucky enough to be there. Bertha did us proud through a pizza worshop, two hundred plus bread rolls and a hundred odd pizzas, she likes to think of herself as official oven supplier to DO 2015. Look out for our article on dough in the latest yearbook. Would be the name of a Transformer which sporadically morphs into blogs and we’ve just about kept them ticking over. If you’re that way inclined you’ll find introductions to starting your own sourdough mother, tales of my paper bag collection, interviews, videos (the same as above), and a rant on doing things right the first time - 10 Bertha’s points to anyone who clicks through to all of them, redeemable in our restaurant. …once we finally find a site. I promise you we’ve been looking. I roam the streets, searching for advertising boards and vacant plots. We’ve a crack team of Friends of Bertha’s - we love you guys - sending us tips on where might be available. Feel free to join this team, come one come all, a shedload of Bertha’s points available to whoever finds us our home. We’ll get there. So where can we find you now? Well since you ask we’ll be at BrewDog Bristol this Saturday, 15th August and Moor Beer Taproom the following week, 22nd August. What’s not to love about pizza and beer?